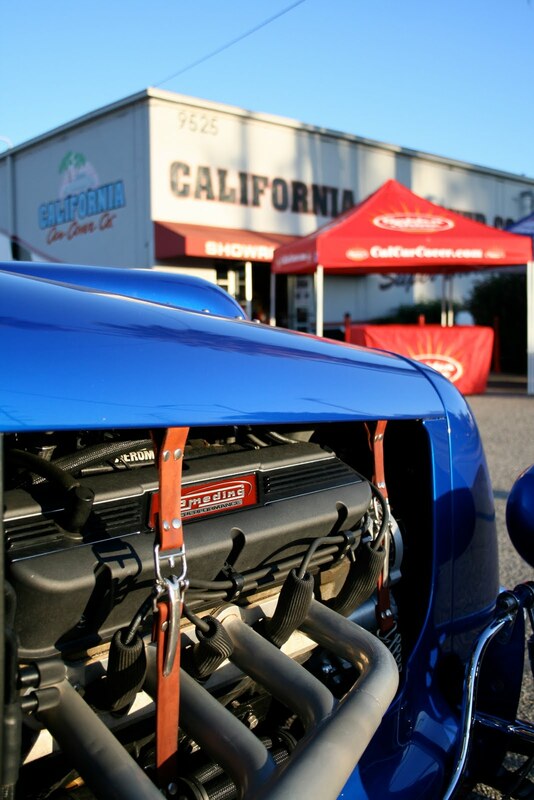 A group of 14 West Coast hot rodders kicked off a drive from Los Angeles to Louisville, Ky at our headquarters on July 30th. The group is heading for the NSRA Street Rod Nationals next weekend. 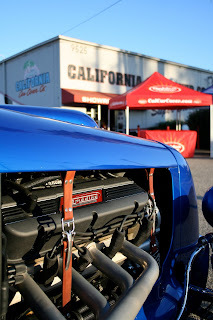 The Road Tour is put together by the great crew at Street Rodder Magazine. The magazine puts together quite a few road trips during the summer. Jerry Dixie, the lead driver, drive tens of thousands of miles each summer promoting Street Rodder and the Road Tour. 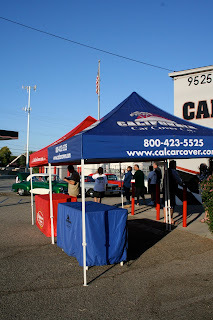 We cannot thank them enough for letting California Car Cover and our new Golden Shine Car Care Products be the official car care provider for the tour. Each participant on this leg of the tour was given a small goodie bag of Golden Shine products to keep his or her classic looking its best on the road. This is the official Street Rodder Road Tour vehicle that Jerry has been driving all summer. Since May, he has already put 12,000 miles on it. Now, that's a daily driver. 14 classic and unique automobiles are driving from LA to Louisville. Here are some photos of the cars making the haul. The guys from Custom Built Machines, located here in Chatsworth, drove over a few project cars to display during the meeting and talk cars with the drivers. 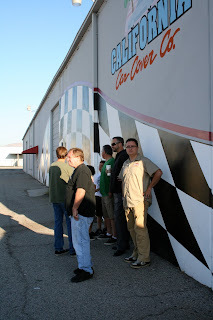 It was a nice morning to get together with local hot rod enthusiasts and hang out before everyone had to depart. Jerry, the tour coordinator, holds a daily driver meeting so everyone knows what to expect and where to go. The first's day trip includes a little more detail as Jerry outlines what to do and what not to do. We assume that you should just listen up and follow him to Louisville. 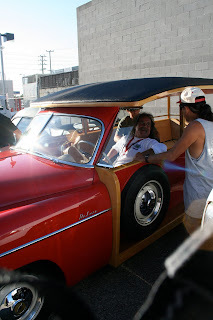 Here's Jerry relaxing in the Chevy Sampan that John Schiess ( in the back) of Custom Built Machines is currently working on at his shop. 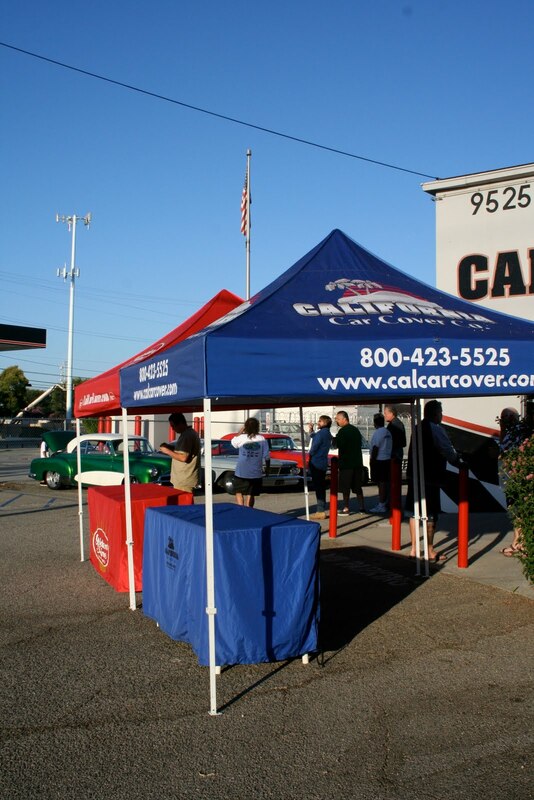 The cars head out of California Car Cover and get on the road. Next stop, Arizona. 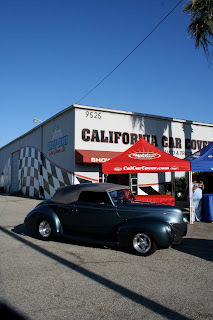 Again, thanks to John, Tim, Jerry and the rest of the Street Rodder crew for letting us be a part of the fun. 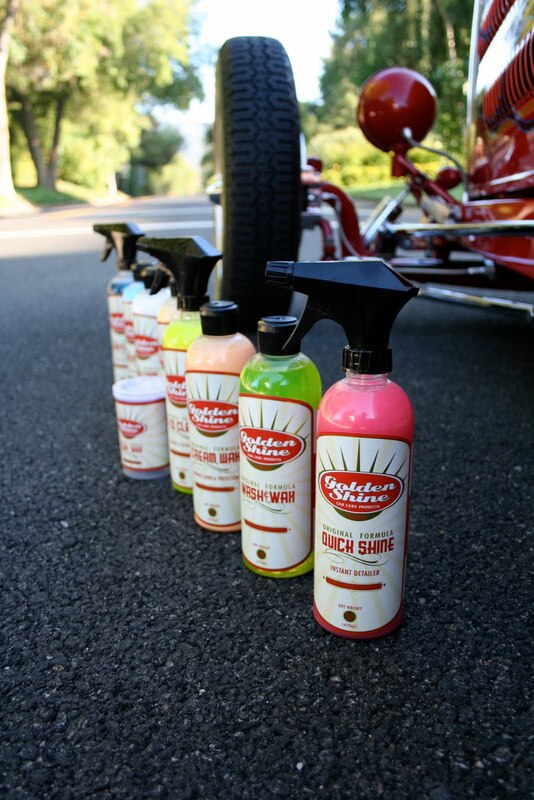 Our Golden Shine Car Care Products are now available through our monthly retail catalog. Volume 1 of our products can be seen in our July catalog, which features a classic 1934 Packard on the front cover. In addition to the initial group of waxes and cleaners; a variety of towels, applicators and combo kits are available for purchase. Our Golden Shine line of products are available just in time to clean your vehicle for the next road trip. 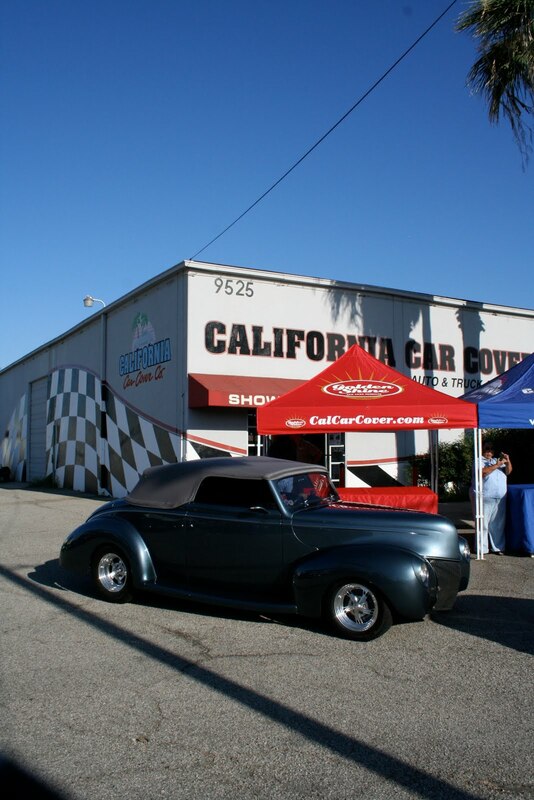 In fact, Golden Shine was recently announced as the official car care provider for Street Rodder's Road Tour 2010. For more details on the tour visit streetrodderweb.com. 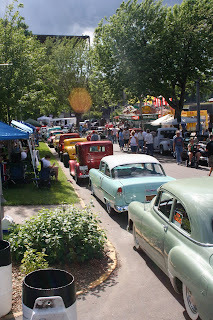 One of our favorite shows to attend each year is the Back to the 50's Car Show in St. Paul, Minnesota. It features nearly 12,000 of the finest classic cars from all over the country. This year we flew in a day early to setup and were able to sneak over to the new home of the Twins, Target Field. The stadium is amazing. It meant we had to hurry up and set up our booth first thing in the morning, but it was worth it. The crowd, stadium and just about everything in downtown was top notch. The guys and I are big time sports fans and we really appreciated the hospitality at the field. The show runs from Friday-Sunday and lasts until the late hours on Friday and Saturday night. Thousands of people fill the streets of the Minnesota State Fairgrounds. The days are long, but the friendly people make the show enjoyable. This event was the first out of state event for our Golden Shine Car Care Products and they were well received. 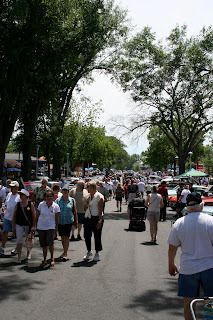 You could spend all three 3 days walking the fairgrounds and I still do not think you would see all the cars. It was nice to see a lot of vehicles from Buick, Oldsmobile, Pontiac and Mercury, makes you do not see as often in Southern California. People walk around the fairgrounds all night long. Once the sun goes down, the fun really starts as car owners start cruising. We look forward to being a part of the show again next year.